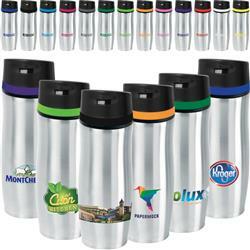 The Persona Travel mug with your promotional logo. Made of FDA compliant materials. Dual wall construction with 18-8 Stainless Steel vacuum insulation for optimum heat retention. Comes with a screw on lid with a convenient push button locking closure. Features a high spout for drinking. Colored silicone band, available in a variety of 12 different colors - White, Gray, Red, Yellow, Pink, Green, Orange, Lime Green, Fushia, Purple, Royal Blue, and Cyan Blue. 14 oz. travel mug. Available Colors: Stainless with White, Gray, Red, Yellow, Pink, Green, Orange, Lime Green, Fushia, Purple, Royal Blue, Cyan Blue bands. Dimensions: 8 1/4"h x 2 3/4"w - 14 oz. Available Imprint Options: Screen Print or Laser Engraving. Inquire for Full Color Imprint. FDA Compliant Materials. Black Non-Woven Drawstring Pouch included. Stainless Steel. Vacuum Sealed Lid. Weight Per Piece: 0.83 lbs.